Understanding what the keywords are that used by converting users and not just driving traffic is one of the most important use cases of Keyword Hero’s data. Focusing on those “money keywords” will have a substantial impact on your total organic sales. We take great care to make sure to not attribute any incorrect keywords to your sales and conversions so that you can rely 100% on the data the Hero delivers. Understanding which keywords are responsible for your organic conversions is one of the most valuable applications of Keyword Hero. Focusing on them has a huge ROI. For you to start seeing conversions in your Keyword Hero property, you first must have either a) e-commerce tracking or b) goal tracking in your main GA property. If you don’t have any of that, you can check out here how to create Goals, and here how you create conversions. You can select ether e-commerce tracking or one Goal from your main GA account to be analyzed by Keyword Hero. Whatever you choose as Goal will become the Goal in the Keyword Hero property, the transactions will be transmitted as such, too. 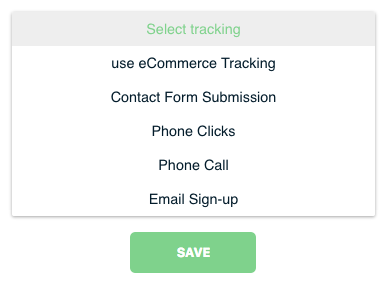 We’re working on allowing conversions to be tracked but that will take a while. 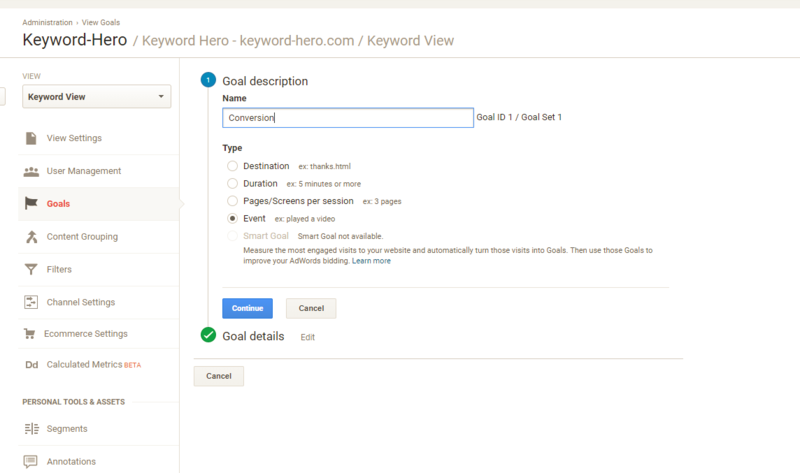 Does Keyword Hero support multiple Goal / Transaction tracking? 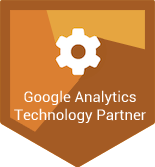 Unfortunately, tracking multiple Goals or Goals + E-comm tracking is currently not possible. It’s really much harder to do than you’d think but we’re working on it. Can I track Events with Keyword Hero? No, we are not supporting any event trackings. However, you can turn your events into Goals, which you can then select as described above. I still can’t see my conversions in my Keyword property? Very often this is the case after you have changed something the Goal settings of your Keyword Hero property. 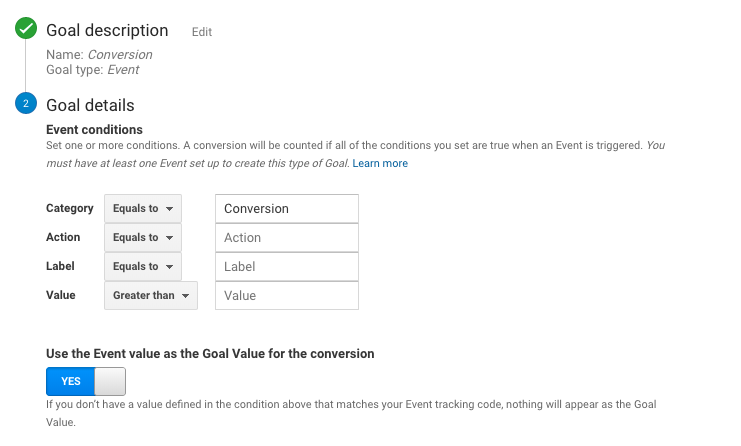 Make sure that the description for your first Goal looks like this: The Goal name has to be Conversion and the Goal Type Event. All my conversions have the keyword (not provided). This will usually happen if your conversions are captured on a third party extension (such as Shopify, Rakuten, etc) or if the conversions happen on a subdomain of yours, such as leads.). In case you use a third party extension, the Hero won’t be able to help you. This just does not fit into GA’s logic and we’re confined by GA. In the case of a subdomain, just add it by adding the subdomain in step 2 of the setup process. I still can't see my conversions in my Keyword property?